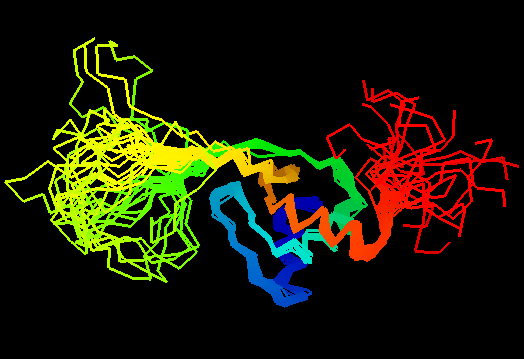 Single domain protein with poorly structured C-terminus and a long loop. Structurally variable regions were removed from NMR models for evaluation of predictions. Fold recognition. Very hard target, as its sequence is a singeton. No server found the right template. 2fug, not found by any server. Local similarity, not covering the entire fold, to YbaK family proteins 1dbx found by some servers. PDB sequence is an exact match to the target sequence, no discrepancies. First models for T0460: Gaussian kernel density estimation for GDT-TS scores of the first server models, plotted at various bandwidths (=standard deviations). The GDT-TS scores are shown as a spectrum along the horizontal axis: each bar represents first server model. The bars are colored green, gray and black for top 10, bottom 25% and the rest of servers. The family of curves with varying bandwidth is shown. Bandwidth varies from 0.3 to 8.2 GDT-TS % units with a step of 0.1, which corresponds to the color ramp from magenta through blue to cyan. Thicker curves: red, yellow-framed brown and black, correspond to bandwidths 1, 2 and 4 respectively.